3DR Solo Drone Review 2019 – is the 3DR Solo quadcopter worth the money? Review of features, pricing, flight duration, battery, camera and more. The 3DR Solo Drone is a quadcopter model with may features that make it user friendly. 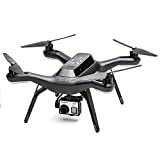 It has everything users need to pair it with a Go Pro camera, for aerial images and video. A Solo Gimbal is available for separate purchase and serves as a stabilizer for the camera. The price is reasonable, so anyone wanting to experience the pleasure of flying and using a drone can do so, even with a limited budget. – Quadcopter with 4 rotors. This provides stability for flight and makes the drone easier to control. – Video game-like controller. This makes it easier to fly the drone, especially for beginners who have little experience with drones. – Push button controls. Easily start, stop, and suspend the drone with a single push of a button. There are controls to start and stop recording, as well as snap pictures. The camera angle can be changed in flight. – HDMI port. Connect the camera wireless to nearly any screen. An app for Android or IOS allows the user to control the drone and watch the flight from a mobile device screen. This is a great way to get real time video or images. – Uses GPS for flight mapping and routing. Also picks up sensor information from rotors. Users may find it easier to avoid crashes and obstacles with these features, particularly when hooked up to wireless screens. The 3DR Solo is a suitable drone for experienced users and beginners. It is designed specifically to be compatible with Go Pro Hero 3 or Go Pro Hero 4 cameras. The Gimbal will only fit these camera models. With a fully charged lithium ion battery, the drone can be up and flying in minutes. – User friendly. Controls are similar to gaming controllers, which most users are familiar with. Push button stop and start make it easier to operate. – Value priced. 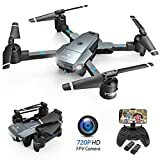 The low price compared to other models make it ideal for beginners or those who are curious about flying drones. – Compatible with a couple Go Pro Camera models. – Watch the drone fly in real time. It can be connected to wireless devices to watch video on the screen as it flies. – A 1/2 mile range. This is a suitable distance for many users and meets FAA regulations of being able to see the drone as it’s being flown. – Light weight. The drone weighs less than 10 pounds shipped. It’s light enough and small enough to be transported nearly anywhere and takes up little space. – Uses GPS for flight, which makes it easier to navigate and map out flight routes for users. It also helps users avoid obstacles. – Includes a charger for the controller battery. – Great stability for those not experienced with drone flying. This is due to the Gimbal and the quad copter configuration. – Replacement parts are available. This makes the drone easier to maintain and to keep in operation, even is a part should fail. – Does not come with the gimbal. It must be purchased separately to provide greater stability and to attach the camera. – Works best with certain Go Pro camera models. Loses functionality if used with older Go Pro models. – Limited flight range. While this may be a great option for most users, enthusiasts may want something with a longer range. – Does not come with back up battery. Must be purchased separately. Compared to other drones, the 3DR Solo is easy to use out of the box. It’s lighter than many and has most, if not all of the desirable features drone operators want. 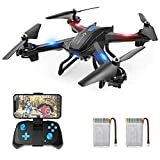 The affordable price makes it easier to get into drone flying, for those who want to try a new hobby or need a drone for surveillance purposes. This drone model is somewhat flexible. However, it’s not as flexible as other models that are compatible with a variety of cameras. Using with other camera models may not be possible or may limit functionality. This will depend on how much functionality the user needs from the camera. If flying a drone is the only objective and in flight video is less important, this model can be suitable for a wide ranger of drone users. Overall, buyers are satisfied with the ease of operation and design of the drone. There are minor inconveniences, like having to purchase the gimbal separately and limited compatibility with certain camera models. Some users have tried older Go Pro camera models, but with limited capabilities. Some drones may arrive requiring setup, such as plugging in wifi cables and charging the battery. This may not be a deal breaker for most buyers, but it may delay the ability to fly the drone right out of the box. Buyers who have spent time using the drone say it’s very accurate and is suitable for novice drone users. It’s reliable, even with the range limitations, due to the use of GPS for navigation. While this model is great for beginners, it’s also suitable for business use. Some buyers say the setup process is minor. Comparable models can cost up to $1000. So the 3DR Solo offers a great value for those who want or need a drone. Most buyers find customer service for the manufacturer of this drone is great. They can get parts and ask questions without much wait time. With all the drones available on the market at different price points, this model offers buyers a great value and affordable choice. 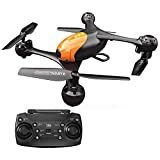 It’s stability, accuracy when flying, and ease of use make it a good product for beginners and experienced drone users. While it’s only compatible with a couple camera models, this doesn’t thwart many buyers. Go Pro cameras are available from several retailers. Once the drone is setup and the battery is fully charged, most buyers have positive experiences with the 3DR. It has also been used in business settings, so it offer adequate capabilities for surveillance and monitoring.